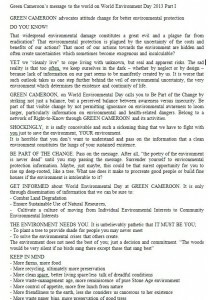 2013, is intended to serve as a framework and provide guiding principles for environmental protection in Cameroon for governments, corporations, civil society and all other parties. 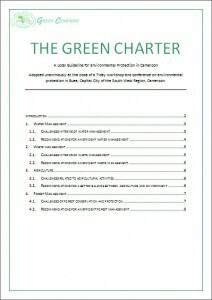 Green Cameroon consulted with national stakeholders, including nonprofit organisations, policy makers, specialists, university lecturers, private companies, members of local delegations, and engaged community members on forest, water, agriculture and waste management to develop this document, hereby called the Green Charter. 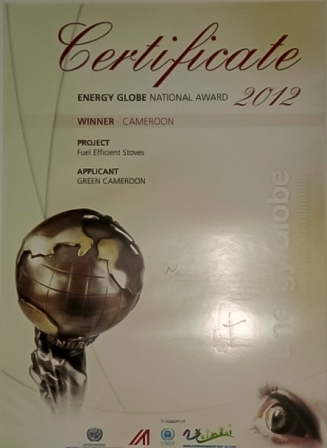 Green Cameroon launched its Green Media Campaign in February 2012, with the ultimate goal of increasing awareness on environmental issues and appreciation of the value and need to protect Cameroon’s natural assets. The Campaign has four major themes: Forest Management, Water Management, Agriculture and Waste Management. 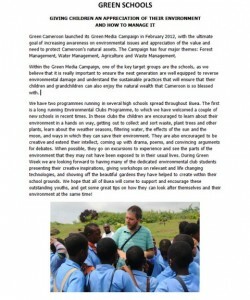 Within the Green Media Campaign, one of the key target groups are the schools, as we believe that it is really important to ensure the next generation are well equipped to reverse environmental damage and understand the sustainable practices that will ensure that their children and grandchildren can also enjoy the natural wealth that Cameroon is so blessed with. That widespread environmental damage constitutes a great evil and a plague far from eradication? That environmental protection is plagued by the uncertainty of the costs and benefits of our actions? That most of our actions towards the environment are hidden and often create uncertainties which sometimes become exogenous and incalculable?